First report from down under « Hercules and the umpire. 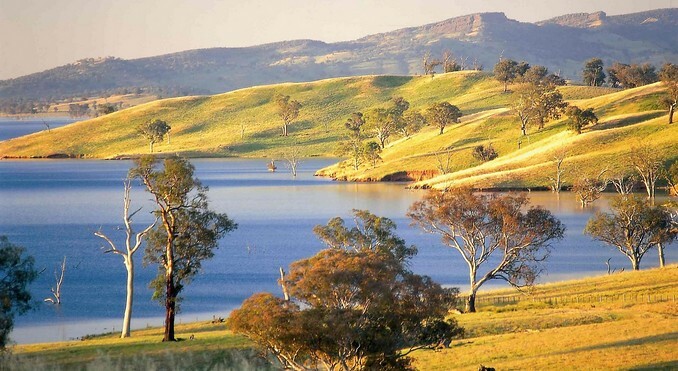 After two overnight but unplanned stays in Dallas and Sydney, finally made it to Lake Hume in NSW Australia. Remote. No cell connection. Internet connection spotty via Verizon. Great place for the kids. Lot to do including petting Ostriches that walk the through the resort and into the wid. Cabins are fine, if a bit rustic. New grand children–Zora and Indy– fill us with joy as we hold them for the first time. The family from Australia and the family from China are fun to watch. Marne and Pat in ABQ, NM cannot be here. Sigh. As grandparents, you take what you can get. Odd thing: We have begun to like our children. They are funny, self-deprecating and well versed. I also remind myself that cheap wine gives false impressions. Sure they’re ostriches and not emus? Emus are native to Australia and, unlike ostriches, have never been known to kick a man to death when they’re grumpy. The first happy trail of many to come. When you are alone and meditating after that rigorous trip and wonderful encounters, perhaps you can help prepare for one bad thing back in the states of the united. But scientists are discovering that — to a surprising degree — we contain genetic multitudes. Not long ago, researchers had thought it was rare for the cells in a single healthy person to differ genetically in a significant way. But scientists are finding that it’s quite common for an individual to have multiple genomes. Some people, for example, have groups of cells with mutations that are not found in the rest of the body. Some have genomes that came from other people. Medical researchers aren’t the only scientists interested in our multitudes of personal genomes. So are forensic scientists. When they attempt to identify criminals or murder victims by matching DNA, they want to avoid being misled by the variety of genomes inside a single person. (The “It’s In Your Genes” Myth – 2). Oh never mind, I’ll tell you about it when you get back and have to work on some motions in habeus corpus cases from those damn lawyers in The Innocence Project and those damn prosecutors from the The Guilty Project. So glad to hear a report from Down Under. Particularly glad to know that you have now bonded with Zora and Indy. Does Petra have a new nickname for you?? So glad you get to see 2 sets of kids and grandkids. I know exactly what you mean about your kids. It’s a blast, isn’t it? Cherish every second. Enjoy! A big “hi” to Lisa from us! Enjoy, as I know you and Joan will. Big debate on that subject. My son the biologist swears that they are ostriches, although his expertise is in fish. Anyway, they are damn big birds. Some things ARE more important than others. Especially attributing quotes to the one who said it. Above all else, fight not to be ignorant. — Declaration of Arbroath. Scotland, 1320. Some statements are so famous that they don’t really need it. I concur heartily. Don’t say you are free men when your kings are judges, and “the law” is only followed in their courts when they find it convenient to do so.